For the last more than 25 years, he has been regretting his decision to come out of his home for opening his shop on January 6, 1993, when the markets were supposed to open after a 5-day strike. It was cold and it seemed as if it would start snowing anytime. 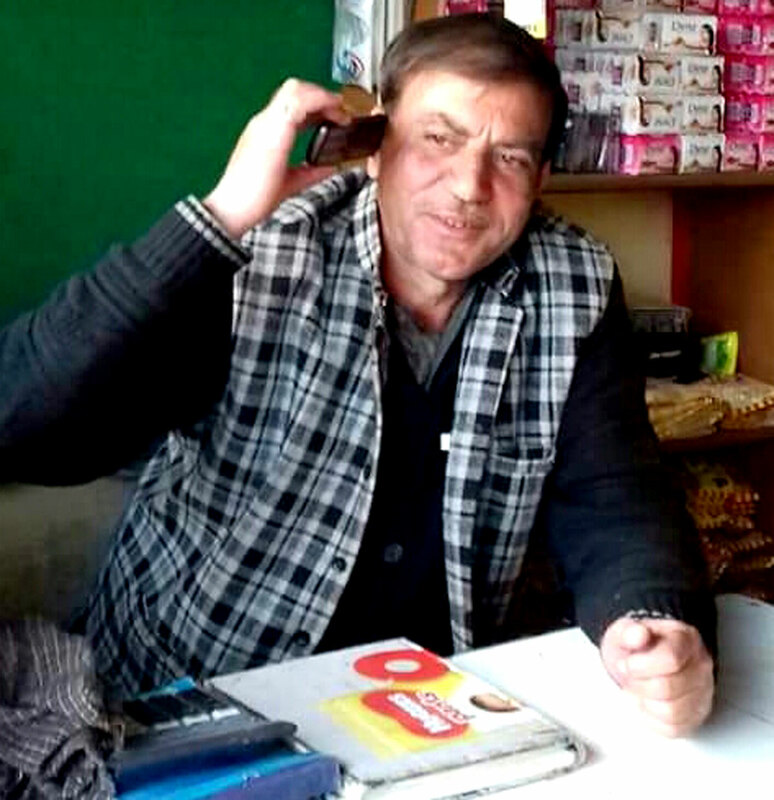 For Tariq Ahmad Kanjwal, one of the major shopkeepers on Sopore’s tehsil road, it was just a routine day. 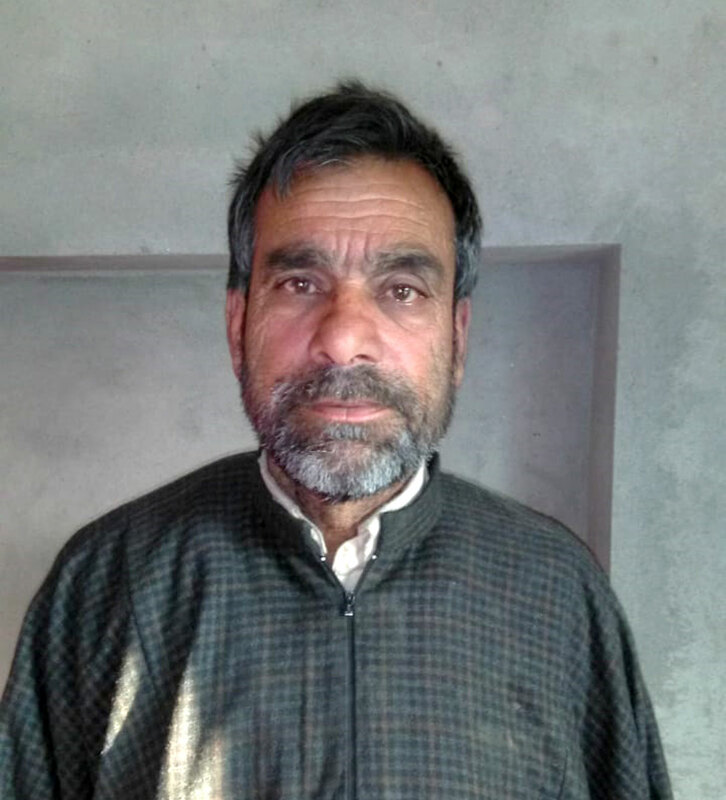 With a Kangri and shop keys in his two hands, Kanjwal said when he moved out on the road from his five-storied home located behind the shop line he owned at around 9:45 am, he found the road deserted. There was no movement of people but the BSF personnel were ubiquitous. The paramilitary men were busy collecting bricks from a burnt down water tank to construct a bunker, he remembers. Fearful of the tensions on the street, he thought of going back home when he heard the familiar voice. “Open your shop, I need a chair to sit down,” a BSF officer, who would routinely be deployed on the spot told Kanjwal. “It gave me confidence and I opened the shop and gave him a chair.” A few minutes later, he asked for a cup of tea. “I went home and got two cups, one for him and another for myself,” Kanjwal said. 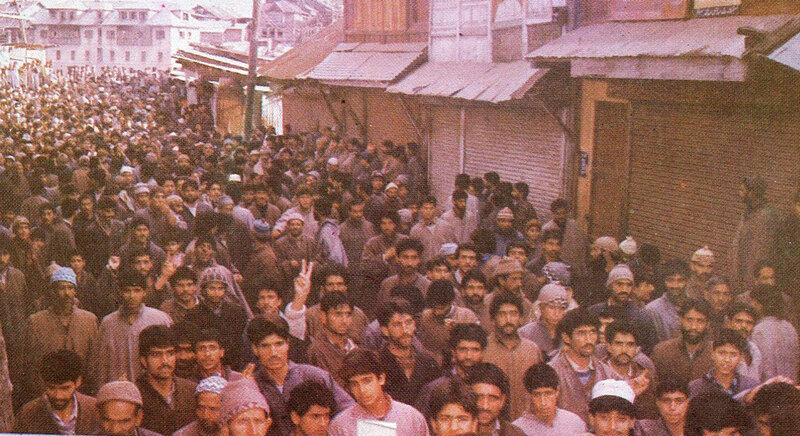 It was a relationship that had evolved over the months since the 42 battalion was deployed in Sopore in April 1992. The officer would tell Kanjwal that he visits him quite often because “you look like my son”. In a panic, as Kanjwal pulled the shutter down, a cane of edible oil came in between and created a space for air and enough to watch what was happening on the street. “For 90 minutes or more, I watched the hell from that gap,” Kanjwal said. 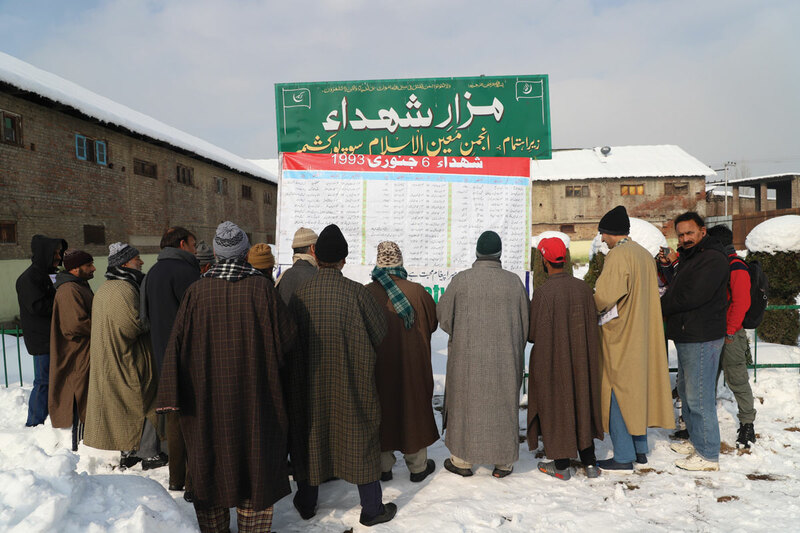 Though all the doctors were trying to revive Kanjwal, especially those from Sopore – Mohammad Yousuf Kanjwal, M S Khuroo and other doctors, there was no headway. Finally Yousuf, now a cardiologist living in the USA, ordered that Tariq is taken out in open and pushed into a snow bath. It worked. He started reacting to the extreme cold, and a few days later, Kanjwal was revived but his tongue and the eyes were still away from their original position. The Bandipore bound bus that Kanjwal watched from a distance was State Road Transport Corporation (SRTC) owned JKY-1901. As many as 11 passengers were killed in this bus and the lone bullet hit who survived was Assadullah Lone, a young farmer from Hathlangoo, a hamlet on the Sopore-Bandipore road. Then, Lone decided to leave the vehicle. “I crawled out of the blood-drenched bus and somehow reached a group of women who took me in the locality wherefrom I was driven to Baramulla,” Lone remembers. “There I was treated for three days and then I came home to participate in the Rasm-e-Chahrum of my wife. Finally, I went to Barzulla Hospital where they decided against taking the bullet out of my arm. It is still there.” Lone had to put a huge battle to raise his six kids, mostly minors. The survivors of Sopore massacre. 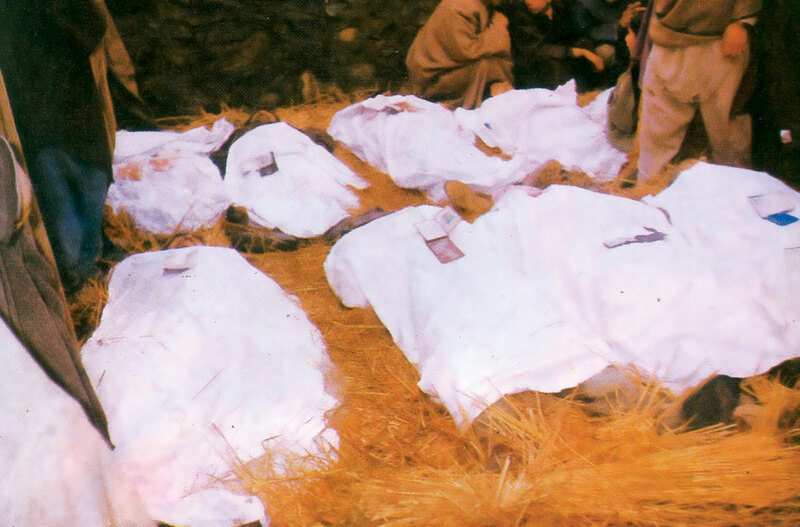 The worst in a series of massacres in the town, January 6, 1993, witnessed the killing of 45 civilians as 16 survived injured. The fire that residents alleged was initiated by the paramilitary proved a deadly blow to the economy of the town that was termed Chota London because of the Apple-created prosperity. 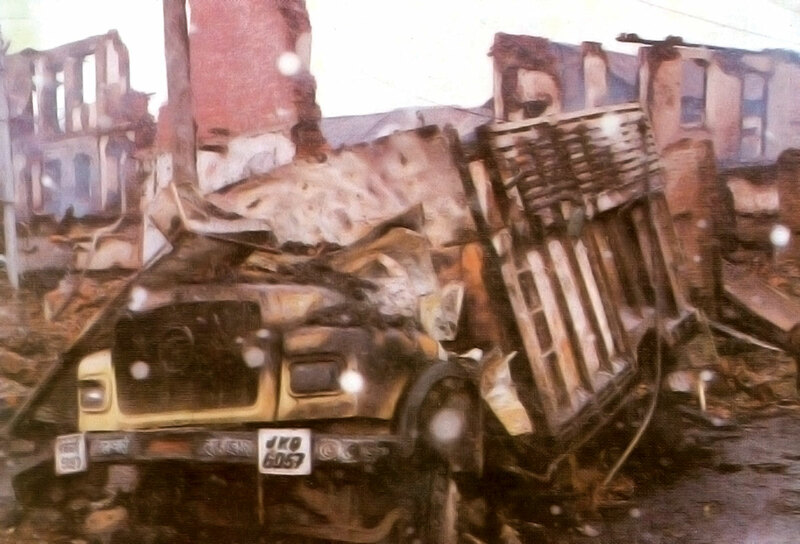 Though only 27 residential structures went up in flames, the conflagration devoured 235 shops, 61 go-downs, 54 Khokhas, two buses, one truck, a car and a scooter. Added with 15 shops that local trade alleged were looted, the costs were put around Rs 30 crore at 1993 prices. Instances in which one member of a family survived and another was killed are many. But in one case, four members of a family got killed. On the eve of the massacre, a family in Shalpora had loaded a truckload of apple. As it started leaving Sopore, it was stuck in a manhole that required unloading. In absence of a crane, they decided to do it on January 6. The family came out and started unloading. They were busy and the incident took place and four of them were killed: Ghulam Rasool, Bashir Ahmad, Mohammad Ashraf and Sajad Ahmad. In fact, the conductor of the truck JKQ 6057, Pawan Kumar, a resident of Jammu was injured in the shootout but survived. There were instances in which the people were caught, lined up and fired upon. The tragedy was the outcome of a group of eight militants attempting to leave the town towards Tarzoo when they faced a BSF patrol. A militant lobbed a grenade and it triggered a scare. A border guard who was eating apple near the truck had his LMG unmanned that militants took. It led to a fire exchange in which a militant was injured along with two BSF personnel, Arvind Panday and Jagat Pal Singh, one of whom (Panday) later succumbed at 92-Base Hospital. After the injured were evacuated by the two sides, the BSF reinforcements rushed towards the spot and fanned in all directions. The rest is history. Enraged, the BSF prevented the fire-fighters from any intervention and even carried out killings while a senior police officer was on spot. While entire Kashmir went into instant mourning, SKIMS sent a doctors’ delegation to the town. Local doctors at the sub-district hospital accompanied cops to a safe locality where people brought charred corpses on the hand-pushed carts and readied the basic medico-legal cases. 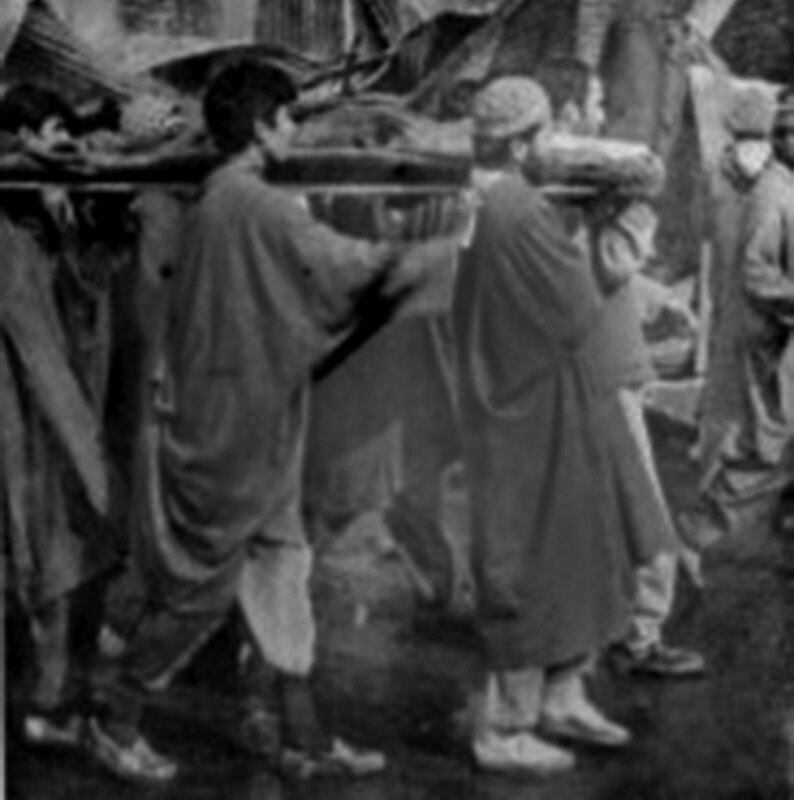 File pic of people carrying dead bodies from Iqbal Market, Sopore. Photo: State Police Crime Branch, which is part of CBI record. By evening top security officials from Srinagar were in town. The next day, the top bureaucracy and various central government leaders flew to the town. Kashmir remained locked for many days. Compensation was announced but, on the call by Hurriyat, then led by Syed Ali Geelani, not many people claimed it. 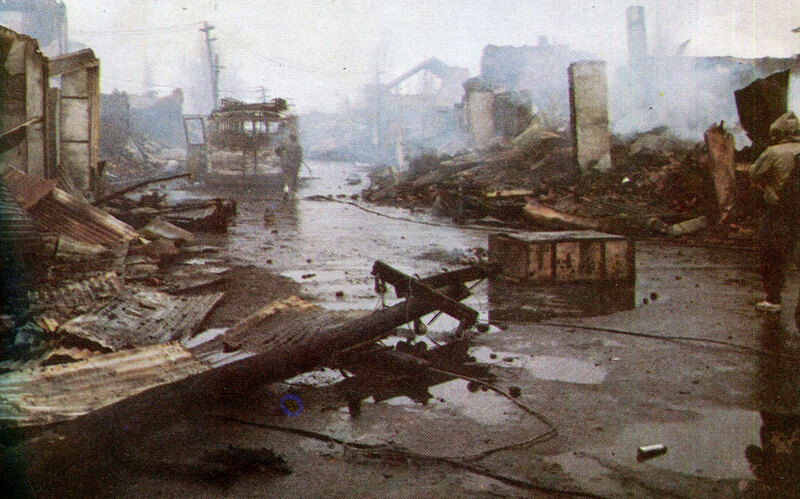 For many days, the residents refused to clear the debris. The governor’s administration, then completely dominated by the security grid, did the follow up to the massacre in its own peculiar style. First, the locals went to the police and registered an FIR with the police. To counter it, the BSF commandant registered his FIR telling his side of the story. 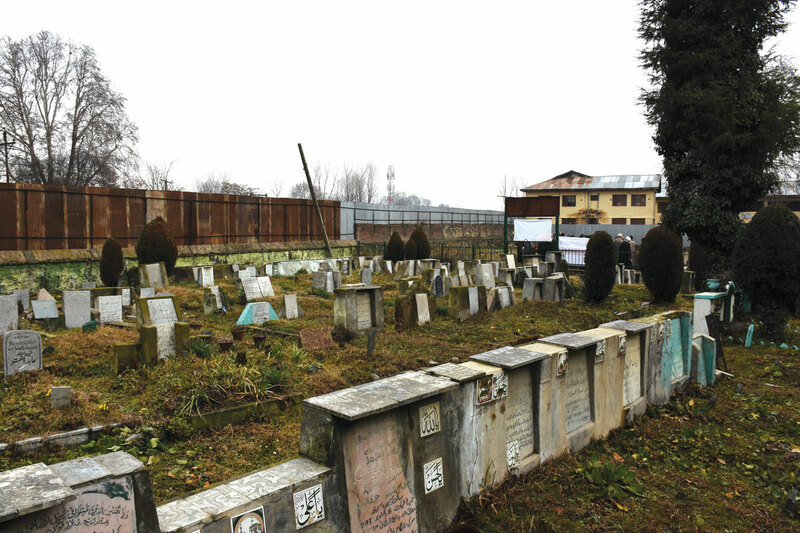 Sopore was still smouldering – the fire was finally controlled on January 8, 1993, that the governor’s administration announced a parallel investigation by the police Crimes’ Branch. The same afternoon, the particular battalion was shifted out of town, to Pulwama. By January 20, the governor’s administration announced a CBI investigation and the details of the cases – with the local police station and the Crime Branch, were shifted to the federal investigator. Ten days later, on June 30, the governor’s administration announced a one-man commission to be presided over by Justice Amerjeet Singh Choudhary, a sitting judge of the Punjab and Haryana High Court, who later became an acting Chief Justice and superannuated in 1998. The government set up an office for the judge and appointed his aides. Despite multiple extensions in his service, he never came to Srinagar. Finally, the government stopped extending its term beyond April 30, 1994. After the case was shifted to the CBI, the police investigations had come to naught. The CBI took its own time – only twenty years, to submit its findings. On July 17, 2003, the CBI filed the reports before the designated court. By June 2014, Kanjwal and many other survivors of the massacre challenged the outcome of the CBI investigations by filing a protest petition before the designated court. The case is going on and it was during the series of hearings that the CBI submitted details of its findings. For the last two years, there has not been any hearing as there is no designated judge to hear the case. Activists have filed a new petition seeking a judge who could hold the charge and decide the case. An investigation that spanned two decades can, by no means, be a simpler one. The federal investigator recorded a set of statements of the civilians and most of the BSF officers as part of its investigations. It had seized 110 weapons of the BSF along with 5865 empty fired cartridges (EFC) of which 981 were fired on January 6, 1993. The weapons were already released by the court after it accepted one closure report of the CBI. Jammu and Kashmir Coalition of Civil Societies (JKCCS) that have managed access to the CBI investigations have done a detailed critique of the CBI closure reports. Beigh survived even after taking a full burst on his leg, which was later amputated. Interestingly, CBI records carry a list of only 33 civilians while as 45 are well documented. Barring three of them, all others had been shot in the head, chest and abdominal regions: 21 in the chest, 11 in the abdomen and six in the head. All the bullets hit them from the front side. In its report, CBI pointed out certain lacunas forgetting that in the prevailing situation literally no autopsy was carried out. CBI investigations attribute the killings to the crossfire, neglecting the statements by civilians and some of the BSF men. In its reports, the CBI has insisted that “injured witnesses, were unable to identify the BSF personnel involved in the incident”, therefore, “it could not be established during the investigation as to who killed 44 civilians and injured 14 persons”. On the mass destruction of property, it attributes to “explosion of gas cylinders during an exchange of fire between the BSF troopers and the militants”. Though the CFSL investigations did not trace any combustible material in the burnt out samples, one sample carried human blood. The investigator reported to the court that it could not do the verification of the civilians who died or were injured because of the “non-cooperation of the local residents”. The fire that CBI believes emanated from a crockery shop in Bhuggo Chowk – almost a kilometre away from the spot of carnage and destruction was selling lighting cylinders and lacked LPG! Since the federal investigator does not hold the paramilitary responsible for anything, it does not recommend any punishment to anybody. In response to a direction by the SHRC in a petition that human rights activist Mohammad Ahsan Untoo had filed as early as 2012, the CBI has referred to the BSF communication that suggested the paramilitary tried 19 personnel in the General Security Force Court under the Border Security Force Act, 1968 for commission of offences under sections 304, 307, and 436 RPC read with Section 34 of RPC and were punished and sentenced accordingly. The personnel who were tried included Prakash Singh, B B Joshi, Ajain Singh, Charan Singh, Sudama Rai, Sanjay Kumar, Raj Kumar, S N Singh, Baljeet Singh, Mohan Singh, Tej Raj Sharma, Ranvir Singh, Chur Chand Sharma, Vachaspati Sharma, Mohan Lal, Rajender Kumar, Virender Singh, and Purshotam Singh. Head Constable Sanjay Kumar had died before the Records of evidence (RoE) were conducted, leaving only 18 personnel for the court-martial. “On completion of the RoE, the charges were dismissed in respect lance naik Baljeet Singh, Constables Umesh Pal Singh, Virender Singh and Purshotam Singh for want/lack of evidence against them,” the CBI communication quoting the BSF reads. This left 14 personnel with some charges. They were “punished”. Sub-inspector Sudama Rai had forfeiture of three years of service for the purpose of promotion and got ‘severe reprimand’. Lance Naik Raj Kumar was given a punishment of forfeiture of one year of service for the purpose of promotion, pension and ‘service reprimand’. Five constables Chur Chand Sharma, Tej Raj Sharma, Rajinder Kumar, Mohan Singh and Vachaspati Sharma were awarded three months rigorous imprisonment in BSF custody. Mohan Singh was later dismissed from the service by his unit on December 26, 1996 (albeit for different reasons) and his name was deleted from the charge sheet. Head constable S N Singh also expired during the pendency of disciplinary cases. Prakash Sigh, an Assistant Commandant faced a separate GSFC and was awarded a punishment of forfeiture of six months of service for the purpose of pension and was ‘severely reprimanded’. His counterpart, BB Joshi was punished by way of “issuance of IG’s displeasure”. The “justice” was made public only after the JKCCS and Untoo chased the case and made the CBI findings public, more than 25 years later. The show is still on.